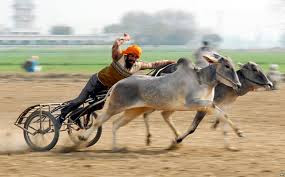 Bullock Cart races should be banned immediately in India and elsewhere in the world. Bullocks used in these races are deprived of food, water and shade for up to six hours. They are forcefully yanked by nose ropes that causes their noses to bleed and are physically abused in order to force them to run - even when exhausted. The animals have their tails twisted, chemical irritants rubbed into their mouths and jabbed with sharp wires with protruding nails to control their movement. Tormenting and terrifying bulls into running to make money is inherently cruel and this sadistic celebration of torturing innocent animals must stop at once. This cruel show of violence proves once again how low the mankind can stoop to satisfy their greed. There are other races, by all kinds of other animals - horses, cows, camels, sheep etc; all over the world. Why doesn't man make other men run such races - kept hungry for 6-8 hours, forcefully yanked by nose ropes, and their bodies pierced by spears? Once man goes through this immenses pain, he will understand the agony animals go through. All violence, in all the forms being inflicted upon animals must be stopped immediately by countries across the world. Once this mindless violence against animals stop, there are chances that violence against mankind will stop too. As someone rightly said, "For as long as men massacre animals, they will kill each other. Indeed, he who sows the seed of murder and pain cannot reap joy and love." of the new people of blogging, that in fact how to do blogging and site-building.